Headed East from Broken Hill for 85 Km on my way to Mutawintji National Park which is the site of Burke and Wills camp 40. Turned north on Waterbag Road and re-joined the track that was followed by Burke and Wills. 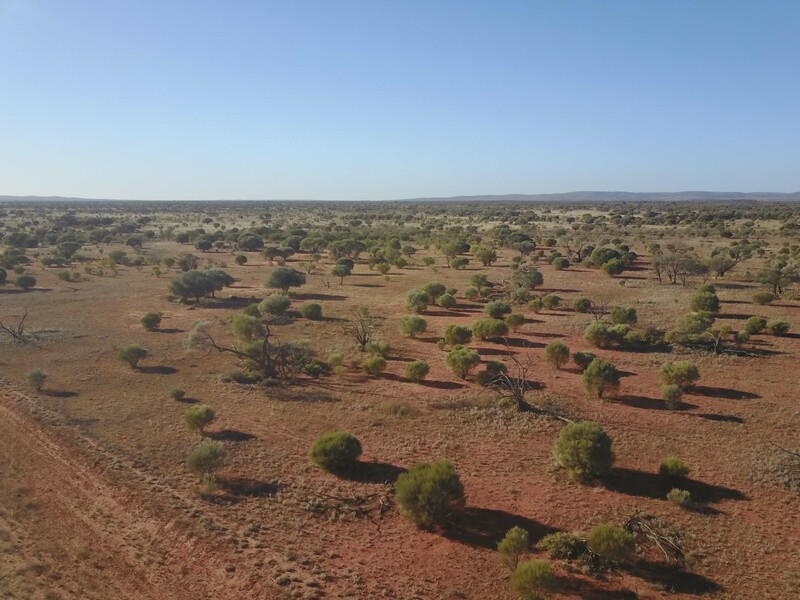 The country is flat and fairly uninteresting with Scropes range in the distance that was crossed by Burke and Wills. 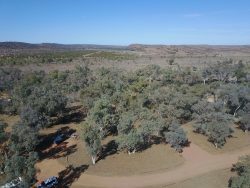 This photo was taken where the road crossed Burke and Wills track. 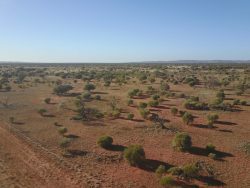 I arrived at Mutawintji over very dusty roads and camped at Homestead Campground, which is where Burke and Wills camped. It is a pleasant campground set on Homestead Creek with lots of river red-gums around, fireplaces & picnic tables at most sites, toilets, solar showers and several gas BBQs. 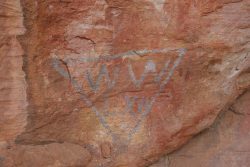 After setting up I went for a short walk up Homestead Gorge, a lovely gorge and in a rock cave you can see a mark made by William Wright in 1862. Wright led the depot team left at Menindee and eventually set off to re-supply Burke and Wills at Coopers Creek. In 1862 he had returned to manage Kinchega Station, he also visited the cave in 1859 and knew the area well. Burke retained him to lead the expedition to Torowoto Swamp, which is north of Mutawintji. 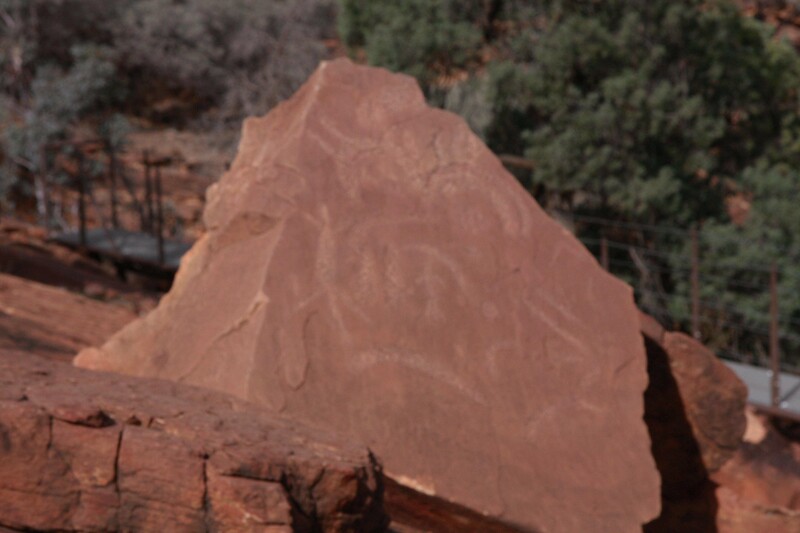 Next day I joined a guided tour of extensive rock engraving art sites with an indigenous guide. 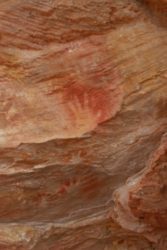 The 3-hour walk was very interesting and covered bush food, aboriginal history and culture, rock art and rock paintings. 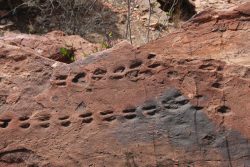 The photos below show an emu engraving Made by hitting a small pointed rock with another larger rock over and over again. 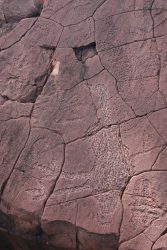 The hillside was covered by engravings, hundreds and hundreds. 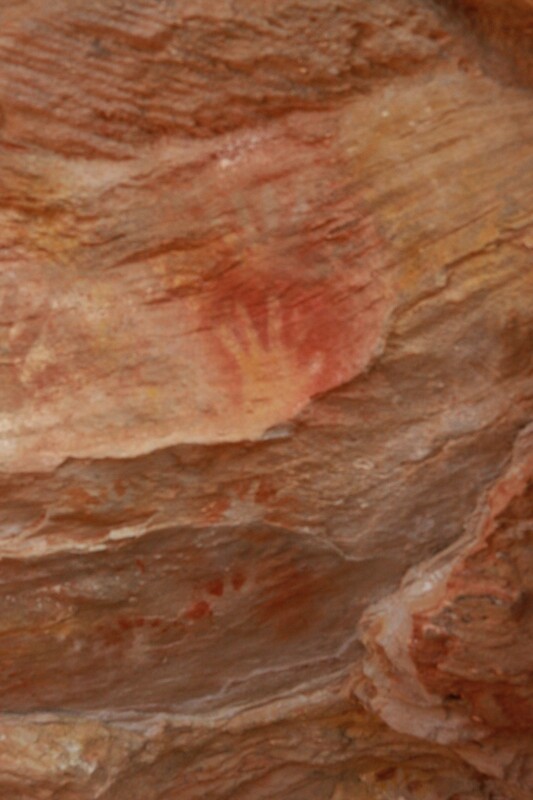 The hands were done by a child and you may be able to see 5 hand prints in a vertical line that the child did to record his/her growth over time, just as we make lines on the door jamb. The rock in the photo below was stolen by some uni students from Melbourne, but they were caught by the police. The elders decided that rather than fine the students it would be better for them to have to return the rock, but instead of letting them park near the site, they were made to park 1-1/2 Km away and carry the rock to its original spot. An appropriate penalty. We learnt why Eremophila’s are called Emu Bushes, only Emus can eat the berries, which are quite bitter. However if you boil up the leaves of the narrow leafed Emu Bush it is an excellent healing liquid in which to soak sores to assist healing. We also saw a spinifex the leaves of which were lemon scented and used to flavour foods. It had seeds like kangaroo grass unlike the normal grass-like seeds of normal spinifex. On the way back to base we saw a rock that had split and exposed a 400 million year old scorpion track. The bit that had split off showed the reverse of this track, like a negative. The guide, Alfred, bought some wood to the large campfire area that afternoon and I joined the others who had been on the tour and we had a very convivial night. An indigenous friend of the guide, Phil, played guitar and sang country music and was very good. Another two campers took over the guitar and ukulele and played more music. 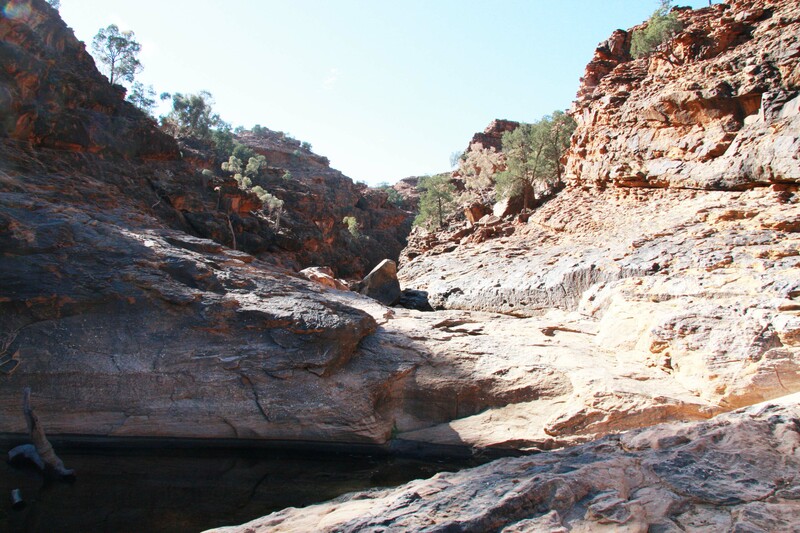 On the next day I completed the 6 Km return walk up Mutawintji Gorge that Marg and I did some 15 years ago, it brought back a lot of memories. 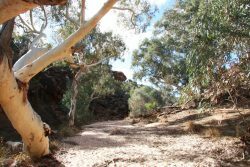 It was also an interesting experience to know you were walking where Burke and Wills walked as they also explored Mutawintji Gorge, while camped nearby. The approach to the gorge was along a red-gum lined creek and then the ranges on either side narrowed to make the gorge. A bit of rock scrambling but other wise and easy walk. I completed the walk with a 5 Kg day pack with camera, drone, satellite phone, EPLB, coat, phone and sundry stuff making up the load. 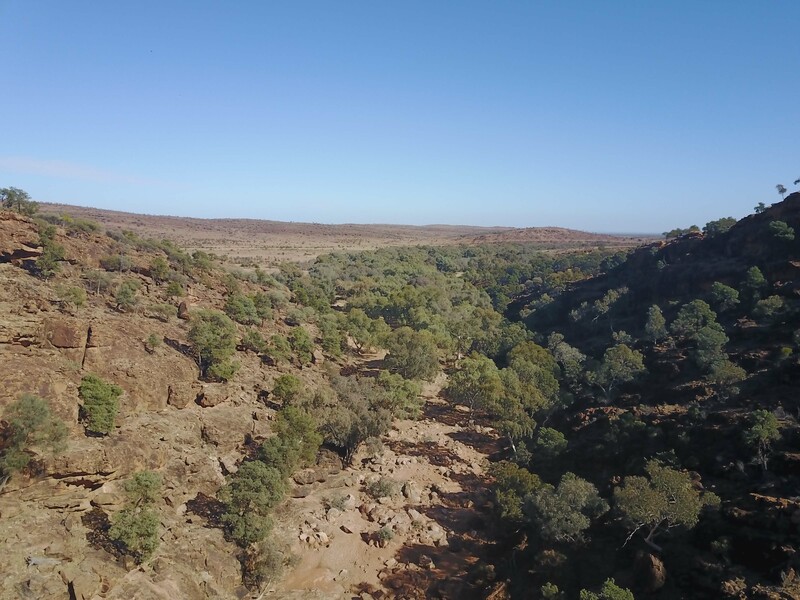 The photos below show the gorge from the drone both looking up and down the gorge. 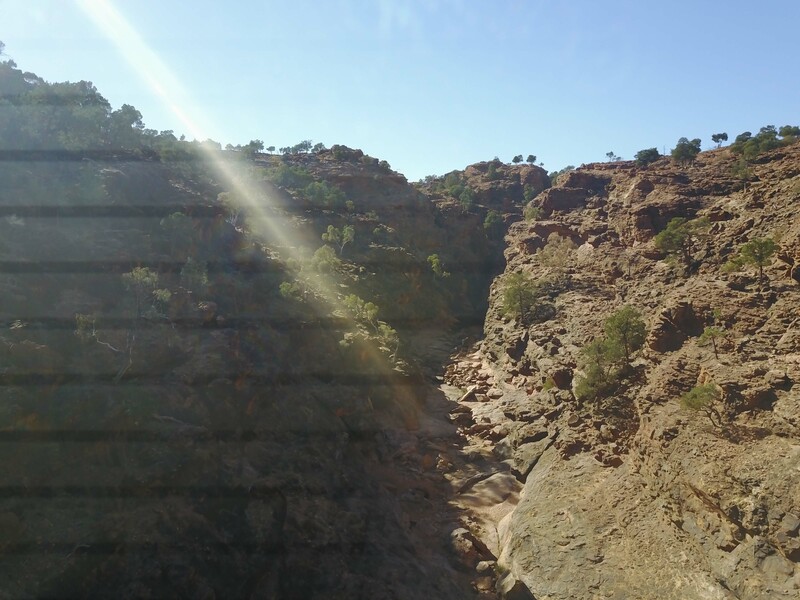 The photo below shows the gorge from ground level. I am now in Tibooburra which has mobile coverage but no TV or radio so I will be doing some reading. 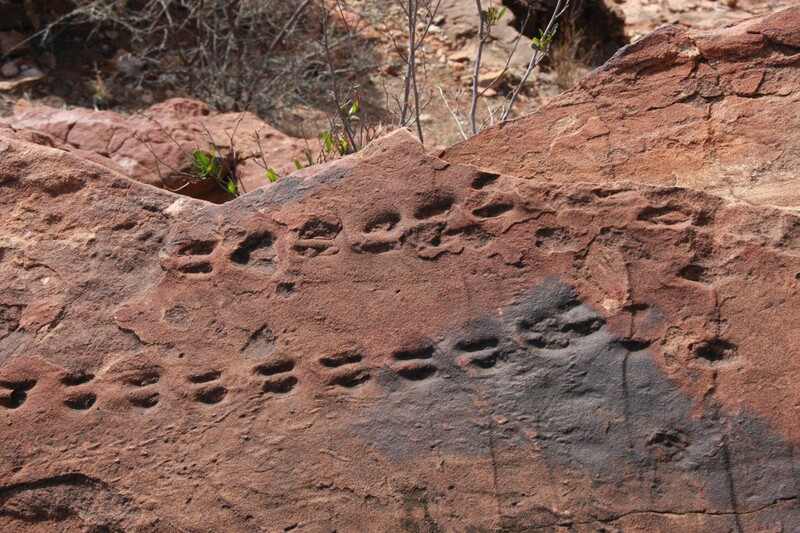 Wow – 400 million-year-old scorpion tracks. I find that remarkable. And I love the story about the idiotic Melbourne Uni students. We were told the same story 15 years ago so I think it must be true. The scorpion track were amazing and if the rock hadn’t split we would never have seen them. The rock that split off was about 200 mm thick so it was a wonder that it broke off. I am enjoying your blog Russ,thanks, great photos too. We went to Mutawintji years ago, but you have seen more with a guide than we did.